A few months ago I finally shared my Homemade Baking Mix Recipe, aka Homemade Bisquick that doesn’t use any shortening. It’s been fun to hear from how so many of you have used my mix to make your baking needs ever so simple. From pancakes and biscuits to coffee cakes and sweet breads, making this mix in bulk and having it available on a moment’s notice is a lifesaver. Our college guys come home tomorrow (YAY!!!) and I know they’ve gotten spoiled with all you can eat buffets, so I have to up my game a bit to do some mom spoiling. This will surely come in handy. I’ve taken a few months to create and taste test over 15 different recipes using my Homemade Bisquick. Since it’s holiday time and we’re all crunched for unique, yet money saving gift ideas, I hope what I am about to share will revolutionize some of your gifts. 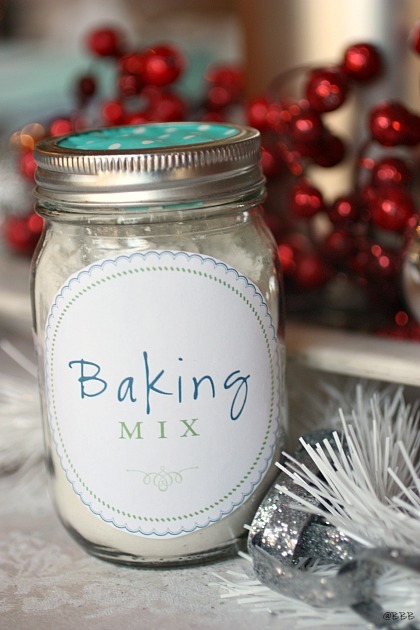 Why don’t you give some of my Homemade Baking Mix or better yet, create a Baking Basket filled with Homemade Baking Mix, your choice of sweet bread and then the recipe printable for your recipient to make their most favorite flavors? 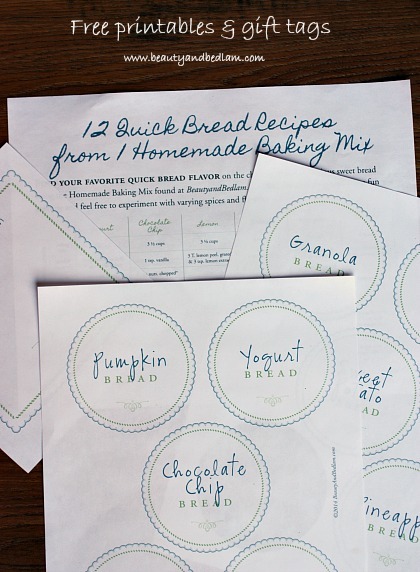 I’ve created full printables with labels for every kind of sweet bread you can imagine, blank labels to fill in, gift tags and a double sided printable which shares 12 Homemade Quick Breads that you can easily make from this one Homemade Baking Mix Recipe. 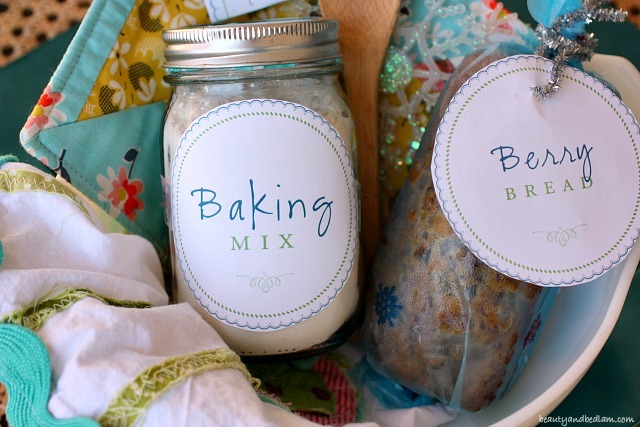 If you don’t have time to bake lots of bread, you can always mix up the Baking Mix in bulk and give large Mason Jars filled with the mix and then attach my cute labels with ribbon. It will be a gift that everyone can use and WILL USE during this most busy of times. 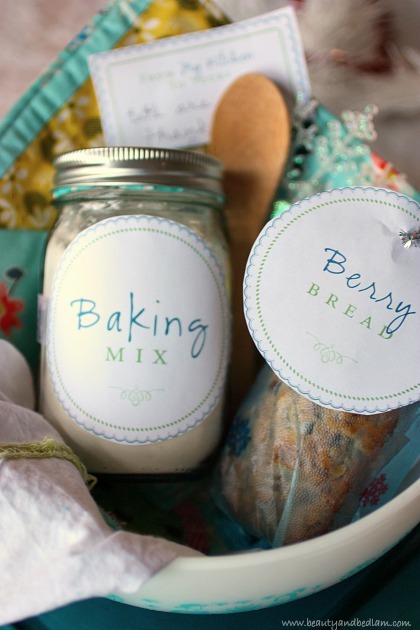 If you decide to go the Baking Basket route, you can pop in the dollar store and find some bread pans or glassware that would be beautiful to use as your “gift bag.” It’s so easy to dress it up for just a few dollars. 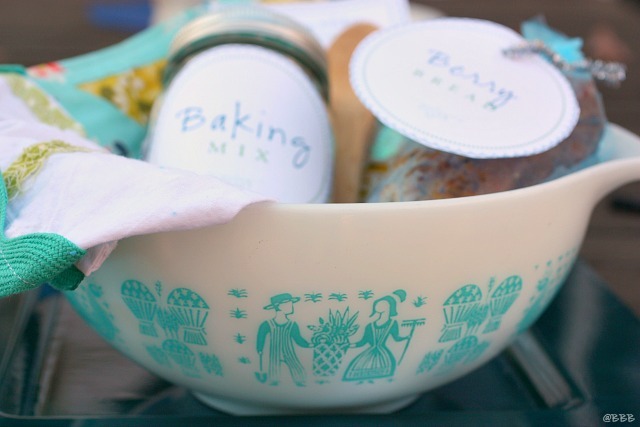 Since I love to scour stores for unique glassware, I enjoy sharing treats in unique bowls, baskets or trays that my friends can keep and it’s vintage Pyrex for the win on this one!! 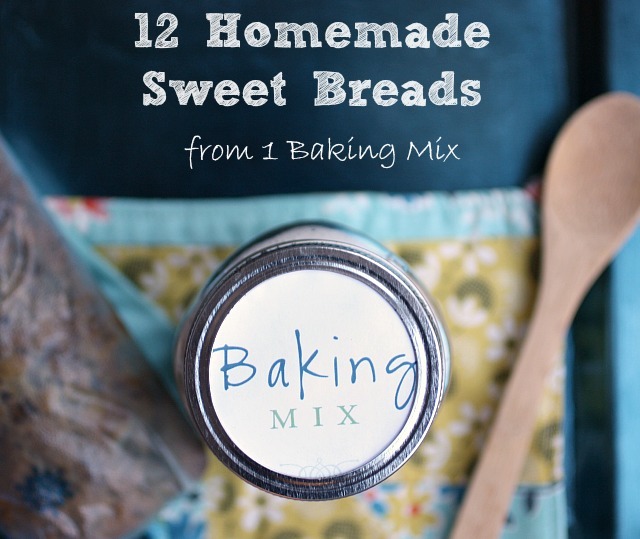 I hope you enjoy these 12 Quick Bread Recipes from my Homemade Baking Mix and that it will be a special gift to you in helping ease the burden of both your mornings and your gift giving. THANK YOU SO MUCH FOR SHARING THIS,I’M GONNA GIFT IT FOR TEACHER’S!! You are a genius, and angel and possibly the most generous person on the interwebs. Thanks a ton for all of this. You just fixed my Christmas! Hi Jen, Here in Australia we don’t have Bisquick, so love the recipe to make my own:) wondering if the low fat version I see on Pinterest would be ok to use with your bread recipes? That is a good question. Since I don’t know the specific recipe you are referring to, just make sure it has enough butter or oil or some kind of fat to hold the breads together/moist enough. I think my mix is fairly low fat as well, so you can just compare ingredients to see. Wish I could help more but I would “think” it might work. I wish you had a couple of the quick bread recipes on this blog site so we could try them before we printed everything. I do. If you note the link to the berry bread and the pumpkin bread you can try those two. Otherwise, you can just choose to print one page and not the whole file . Just select the one page after you pick “print.” Hope that helps. Thanks so much for this handy recipe! 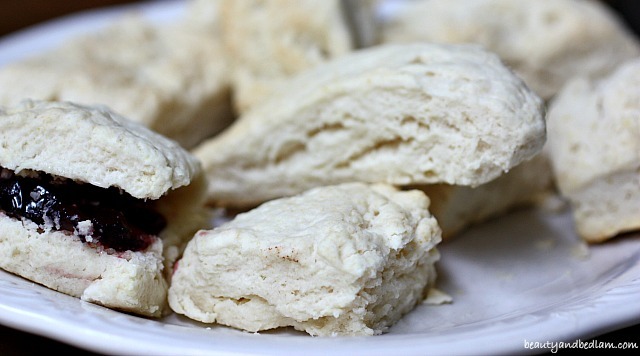 I just tried it out, making a small batch of four Parmesan scones. It was indeed a treat! I have the mix stored in a mason jar in the fridge, and it has kept well like that since I made it a couple of weeks ago. The dough was softer than my usual scone recipes, but maybe the cup I measured out was too lightly measured. I’ll weigh it next time. Thanks again – so useful for small households of one or two. I don’t bake much just for two of us. Love your baking mix and bread recipes. Saving money now that I’m retired is a higher priority and I have no excuses that I don’t have the time to make the mix! The fruit juice is what gives it the flavor/sweetener, but milk would probably work as far as it rising etc. Just would change the taste. Im not much help on that since I haven’t tried it for flavor 🙂 Let me know if it works . My son is allergic to eggs and I usually substitute a “flax egg” for egg in quick break recipes (1 Tbsp ground flax and 3 tbsp warm water). 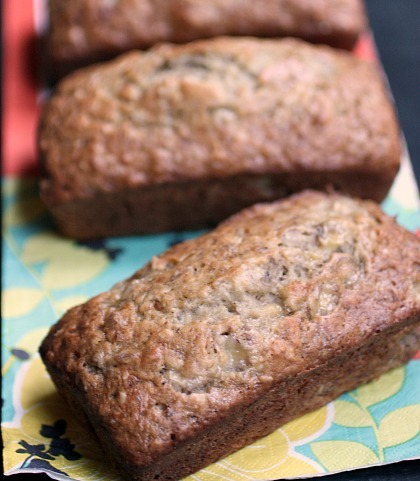 Do you know anyone who has made your quick bread recipes using the flax egg substute? I am going to try it and can report back if you like. Thanks! Love your mix! I use it to make a fruit bread. 1/4 cup dried cranberries, 1/2 cup dried apricots, and 1/4 cup raisins. Cover with water and boil until soft. Drain and add to bread mix and bake as usual.